I have decided that 2014 is not going to be the year that I try to get twenty books off my "to-read" list. It's going to be the year that I read long books. We, the Drowned is the first of my epics, and it is a dandy. About a year ago I was sequestered in a hotel somewhere in LA waiting for Brian to audition for The Voice. There was a lot of down time and a lot of together time with Brian and at one point he said that he was ready to read an epic. 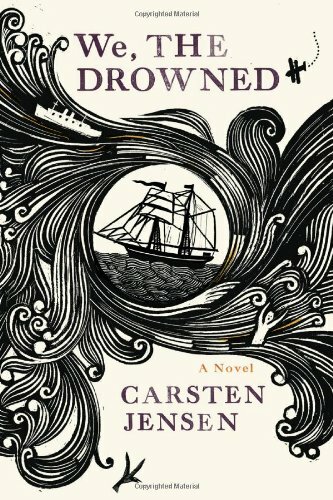 Coincidentally, We, the Drowned was the next day's Kindle Daily Deal and it was described as a story "spanning over a hundred years," so I bought it for both of us on just that recommendation alone. It took me 10 months to start it; I shouldn't have waited so long. The book is the story of the Danish town of Marstal and its people, many of them sailors whose livelihood depends on the sea. But the sea is fickle and many never return. The story begins in 1848 as Denmark and Germany go to war and for the next century follows the fortunes of men who board the large ships that leave Marstal and the women left behind. The narrator of the book uses the pronoun we to tell the story of these men. At first I found that distracting but as the stories rolled on I began to see the point and by the end of the book I loved that Jensen used that technique. How else does a town refer to itself? This book really grew on me. I had trouble finding the rhythm of the book at the beginning and then about a third of the way through I found myself wishing for free time with my Kindle so I could read some more. When I finished I went back and reread the beginning (that never happens) and I appreciated it so much more than on my initial reading. Really great book! Highly recommended!